The SPEC MIX PA1000 Power Auger Delivery System is the ultimate system for maximizing a contractor’s efficiency by increasing the mobility and versatility of the material mixing station. This low profile unit holds one bulk bag (3,000 lbs. or 1,360.8 kg.) and is easily loaded with a large skid steer or even a small single-stage forklift. Its base is the size of a standard pallet and weighs only 1,100 pounds (499kg.) when empty. The PA1000 system is suited for use with any size batch mixer or mixer-pump equipment. The compressed footprint makes it ideal for tight spaces, interior jobs, use in floor to floor multi-story applications, for masonry fence and sound walls, on interior cross walls or anywhere that mixing station space is limited. The PA1000 optimizes productivity by keeping the mixing station close to the work zone. Used with SPEC MIX preblended bulk bag products, this gas or electric powered material delivery system eliminates on site batching of materials, wasted product, wasted sand, labor, and disposing of paper bags. 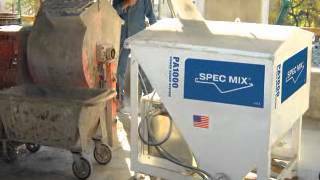 The PA1000 dispenses preblended mortar, grout, concrete, shotcrete or stucco into a mixer quickly, consistently and safely to decrease cost and increase profitability. The SPEC MIX PA1000 Power Auger Delivery System is designed to increase a contractor’s efficiency by providing a mobile system that dispenses material close to the craftsmen. This power auger unit can feed a batch mixer or mixer-pump at a rate of 9 cubic feet of dry material in just 2 minutes, regardless of the product specified. The PA1000 eliminates the lifting and shoveling required for traditional mixing methods, and it even eliminates the extra labor required for handling premixed 80 pound bagged products. There are no more sand piles and pallets of bagged material limiting your mobility and efficiency.